To cover the legal and application costs associated with its effort to win approval for continuing to operate as a restaurant at 17th and Galer, Volunteer Park Cafe announced Tuesday that it is holding a fundraiser dinner and art auction in November. You can add it to your calendar along with two other upcoming dinner dates to support good Capitol Hill causes. The VPC benefit’s details are still being worked out but we’re told that it will be hosted in West Seattle at The Sanctuary. No word on cost to attend, yet. You can check out http://www.alwaysfreshgoodness.com/ to learn more. Earlier this month, CHS reported that the cafe had spent more than $18,000 just in fees to the City of Seattle during the year-long process to win the approval. We’ve sent a mail to the representative for the Volunteer Park Neighbors group to ask if they’re planning any benefit to cover that group’s costs from the process. 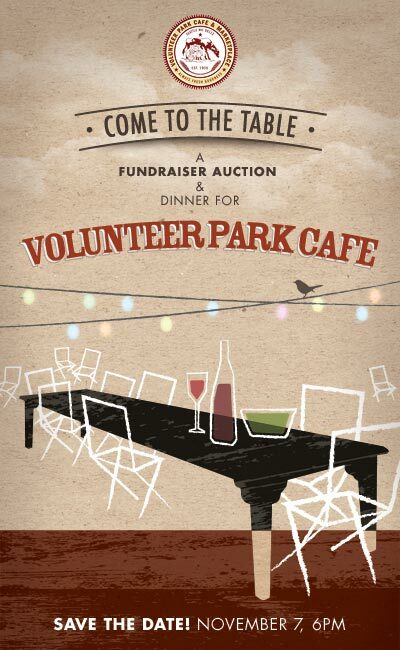 Feast, fete and celebrate in support of Volunteer Park Cafe on our quest for a happy neighborhood restaurant. The last year presented us with some battles, but we did not give up! Neighborhood love! As some of you may know, for over a year the cafe has been going through a rezoning process with the city of Seattle to change its use from grocery to a restaurant. We are thrilled to say we have just received proper permitting! However, the expenses with attorneys and the city have piled up and now YOU can help. We would like to celebrate, send thanks and ask for your amazing support. We hope to see you at the table. Ethan Stowell Restaurants, Quinns, Springhill, Skillet Diner, Stumptown Roasters, Tom Douglas Restaurants, local farms, local food folks and more and more every day. Meanwhile, the Capitol Hill Chamber of Commerce is also asking you to save a November date for their annual fundraiser. More info at http://www.caphillchamber.org/ as the date approaches. November 4th will be a great day on Capitol Hill. It’s our annual celebration, A Capitol Affair! This year’s theme is a Night at the Speakeasy , so put on your pearls and grab your beaver coat for a night filled with delightful, delicious decadence! 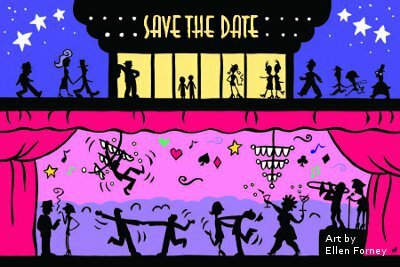 The party will be held at a Seattle institution, the Rainier Chapter of the D.A.R. House on Harvard Avenue. More details to come – but mark your calendar now. Rest assured, this is not an evening that you will want to miss! A Capitol Affair, A Night at the Speakeasy. Friday, Nov 4, 2011. 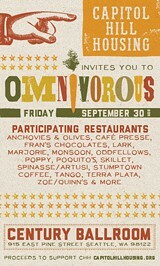 Capitol Hill Housing invites you to Omnivorous. Omnivorous features the best restaurants, brewers, coffee roasters and dessert makers of Capitol Hill showcasing their creations in a fundraiser for Capitol Hill Housing. Food will be served until 9:00 pm. Each restaurant will present signature Hors D’oeuvres and desserts designed specifically for this event. Guests are invited to stop in for a bite or stay for the night. Participating restaurants include Anchovies & Olives, Café Presse, Fran’s Chocolates, Lark, Marjorie, Molly Moon’s, Monsoon, Oddfellows, Poppy, Poquito’s , Skillet, Spinasse/Artusi, Spinasse, Stumptown Coffee, Tango, Terra Plata, Zoe/Quinn’s and more. Capitol Hill Housing has been creating and managing quality affordable housing in Capitol Hill and other Seattle neighborhoods for 35 years. Our vision is of a community that includes secure, comfortable and affordable housing opportunities for individuals and families across a broad range of incomes to support social and economic diversity. I hope it’s a huge succe$$. They deserve it. Whatever application fees Ericka paid are exactly what every business has to pay to re-zone. She can’t blame the neighbors for standard fees. It is extremely odd that she her original business plan did not take into account these fees. She can’t blame the neighbors for her own late fees. (Those records are on-line. Ericka was months late on fees, which delayed the re-zone process by months.) The extended period it took to get her land-use change is also her responsibility. Finally, why would anyone donate money to pay another adult’s legal fees? Is VPC now a charity? This place is turning into a joke but I guess if the scones are good everything is ok. I always found quite odd the willingness of the cafe’s supporters to completely and vindictively dismiss any criticism of Heather or any suggestion that a more mature and collaborative person could have avoided this whole mess. I guess now those supporters can step up and donate money so she doesn’t have to, you know, pay the normal operating costs of her business. Seriously, this is just plain weird… is not offering items for sale to the public not enough? If they need more dough, uh, raise price like any normal business… wow, I’m actually a little shocked. Fees not in the business plan because cafe didn’t know they needed the permit change YEARS ago when they opened. Remember this whole issue was a “gotcha” from the grouchy neighbors. Unlike the neighbors with extra time and money on their hands, the small business has suffered financially. It’ll probably be a great party. as I am extremely perplexed at the notion of a for profit business holding a fundraiser to pay legal bills. This is just awkward to me and with the sheer amount of backlash this is going to generate, I can’t imagine it’s going to garner much money. But who knows. I don’t have any beef with VPC myself, but seeing this whole thing blow up over the last year has permanently put me off of the place. I don’t really want to frequent a place I know had so much public and political drama. And I’m certainly not going to root for them or give them any money for what has been an extremely embarrassing situation for all parties involved, to say the least. I don’t like to go back-and-forth b/c it just adds to the clamor. But, really, you can trust me: when VPC opened, there were laws regarding the need to legally change land-use if you are going to change the use from grocery to restaurant. If anything has been around for years, it is those laws. From what I understand, VPC owners made no effort to investigate their legal responsibilities before opening. To Snarky Again: you might be confused about the former legal use, which was non-conforming in a residential neighborhood. As the neighbors’ blog points out, non-conforming use of grocery was grand-fathered in years ago. That use has no effect on VPC’s legal responsibility to assure the land-use was for a restaurant if their plan was to open a restaurant. Impressive list. Good to see the city’s top restauranteurs support the cafe. I’m sure this will be a wonderful event. Why all the hate anyway? I thought the petty neighbors were “embracing” the cafe these days??? Move on already and find a different frivilous lawsuit to profit from. Wink wink. In the last article Justin wrote on this subject, he posted Ericka’s sad but plucky little e-mail, looking forward to using her creativity and so forth. This event is without a doubt a most creative way to move forward. I am truly surprised that other chefs, far more accomplished than she, are willing to lend their names. It is does not reflect well on their judgement. As for CHS, Justin, you continue to receive complaints about your biased reporting. VPC’s event is not newsworthy. You should be as embarrassed as the chefs. You should stop listening to your wife and stand up for fair journalism. Or at least for your business reputation. Raise 18k (18K!) for a for-profit, overpriced, overcongested yuppy eatery during the middle of the worst recession in years? How about raising that money for all the social services right in this neighborhood that serve the mentally ill, homeless and drug addicts some of you people are always complaining about. These agencies have taken major budget hits due to the state budget crisis. But nevermind, go ahead and give your money to these stuck-up women and their for-profit little cafe???? Yuppy eatery? I only see neighborhood families happily eating there. The 1980’s called…they want their silly insult back. Are you one of the 3 miserable senior citizen neighbors who started this fuss? There is no shortage of good causes out there. I’m sure you donate to none of them. You’re right Haim. Yuppy is a bit outdated. How about rich people who don’t pay their fair share of taxes? That’s pretty 2011, no? And no, I’m not one of those senior citizens but way to pay respect to some elders in our community. I’m just a miserable middle-aged person who has lived in this neighborhood for years and can’t stand that restaurant. I wasn’t involved in all the turmoil but it sure made for entertaining reading. Thanks! A Yuppy can have a family. Look it up before you comment. Ok, so you admit your miserable. Next. Yes. She admitted she was miserable and you showed you were an immature twit. Now, we can say next. Actually, you are right. It should not cost. It cost 18K, as I said above, because of VPC’s late fees and then lawyer fees. Both of those were avoidable, had VPC paid their fees on time and worked with the neighbors rather than take this pubic and then legal. I If it were going to give VPC $, I’d ask to see the books first. Don’t non-profit records have to rectify expenses against income to retain their 501-3(c) status, and things of that nature In the case of a non-profit, I’d look to see that the organization was well-run and needed the money, rather than merely wanting more. Who among us wants to pay legal fees? People are allowed a single, annual donation of 11K. If some of VPC’s supporters want to give Ericka that amount, they have more disposable income than I do. As for me, that money is going toward my kids college accounts. These posts are a hoot aren’t they? So much anger. I know this fundraiser is going to be a great success and they will thrive from here on in I hope. And the angry neighbor group will have to deal or move. Unlike the sad lonely bitter posters here VPC apparently has many friends. Some of you here need a hug…badly! NEXT. So says the sad lonely Haim who continues to post and troll on a neighborhood blog. All of the comments about bitter angry and miserable people makes you seem like you have trouble dealing with your own issues. Wow. Pot meet kettle. This was a thread celebrating a fundraiser that one can attend at his or her choosing. It turned into a lunatic fest. All the trolling here won’t change things it will hopefully happen no matter what. You lose. Boo hoo. Yet…a poster(s) here attacking supporters, patrons, other restaurants supporting Volunteer Park Cafe, the owner of this blog, the owner of this blog’s wife, “rich” people, yuppies, people with disposable income. Like a sad cornered animal. Very sad. Someone should take her meds. NEXT. Nobody forced YOU to go in the corner and stay there. [insert sarcasm]I can’t imagine who you mean??? Wink. Wink.